Animal realm (Skt. tiryak; Tib. དུད་འགྲོ་,dündro; Wyl. 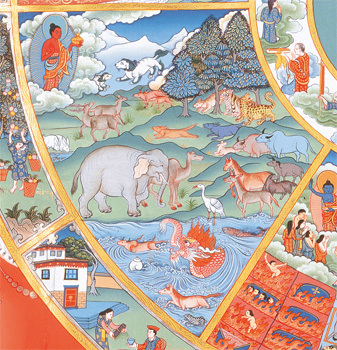 dud 'gro) — the realms of the animals among the six classes of beings. Animals either inhabit the great oceans ('animals living in the depths'), or live mostly on the earth, in water, in trees, in the realms of the gods or humans ('scattered animals'). This page was last edited on 26 January 2018, at 13:22.